We're STILL talking about all the hits and misses at this year's Met Gala, but there's no denying the accessories were on point at the glitzy China: Through the Looking Glass affair. Lady Gaga knows what the Met Gala is about – couture and drama. She definitely brought it to the red carpet, with a chic, iridescent headdress, proving that she's Mother Monster for a reason. We're head over heels in love with Lily's sparkly koi fish clutch! She proves that you can be playful and chic at a glitzy red carpet event. It wouldn't be a Met Gala fashion post if we didn't feature Riri. She stole the show in a magnificent and luxurious Guo Pei couture gown, but it was her accessories that really finished off the look. The ornate floral headpiece and rose-gold chocker necklace add to the drama of this show-stopping look. Selena interprets the theme of the night beautifully with a spectacular white orchid headdress and sparkling chandelier earings. Zendaya Coleman shone in an exquisite sun motif tiara and matching cuffs. Her multitude of flashy designer rings completed the lust-worthy look. The actress' jewel encrusted Prada cape had us swooning for days. Her complimenting chandelier earrings punctuated the look perfectly, and her interpretation of the theme is flawless. 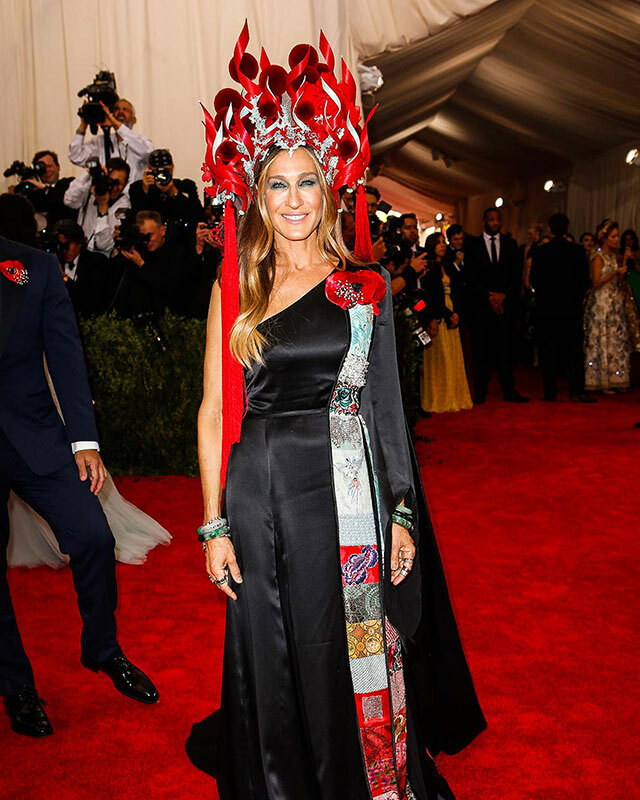 One of the most talked about accessories of the night has to be the Philip Treacy headdress and Cindy Chao brooch that SJP wore. There were mixed reactions from both the public and fashion world alike, but the one thing we can't deny is that this fashion icon knows how to commit to a look and own the red carpet. Fabulous!